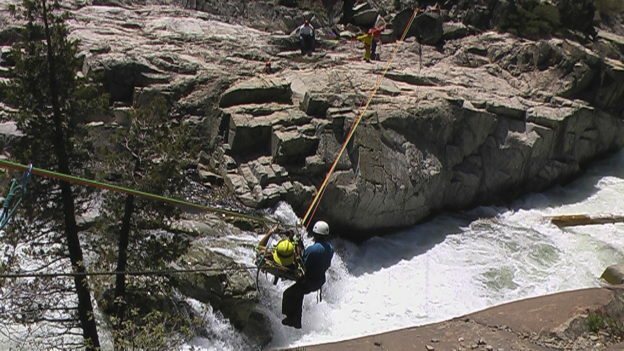 This is the whole shebang for the National Fire Protection Agency (NFPA) training requirements for Swiftwater and Technical Rope Rescue Technician. This NFPA Technician Level compliant course combines the curricula of the Technical Rope Rescue Technician Level, Swiftwater Rescue Technician 1 and Swiftwater Rescue Technician Advanced into one class. The Technical Rope Rescue Technician Level is taught in low, steep and vertical angle rope rescue environments. The Swiftwater Rescue Technician 1 teaches the fundamental rescue skills for swiftwater and the Swiftwater Rescue Technician Advanced brings together advanced swiftwater techniques and rope rescue techniques in a swiftwater environment. This course also includes a night search and rescue operation in a river environment, vertical litter rope scenarios, high line tyrolean rope and boat systems and more!! Hands on, full days lead to full immersion in the Swiftwater Rescue and Technical Rope Rescue environments. It is a very intense training and will get folks the training required at the Technician Level as defined by NFPA! Optional Upgrade: Receive a Professional Qualifications Workbook for an additional $225. Most agencies do not require this upgrade but if yours does, we have you covered! You can choose this add-on during your checkout.